This expansive choral fanfare has been usurped by dozens of filmmakers, TV producers, commercial advertisers and even video game developers over the past five decades. As a result, “Carmina” has become one of the most popular concert pieces in the classical repertoire. And this is even without staging and dance, which Cincinnati Ballet will provide as icing to the cake, in six performances, Feb. 8-11, in Music Hall. The Cincinnati premiere is co-produced with Ballet West and choreographed by that company’s renowned Nicolo Fonte. The massive setting features 18 Cincinnati Ballet dancers accompanied on stage by the 75-voice May Festival Chorus and backed by the Cincinnati Symphony Orchestra under the baton of Carmon DeLeone, in his 49th year as ballet music director. Ballet West premiered this production in November. Costumes were built by Ballet West, and a truss set, which raises choir members high above the dancers, was fabricated in Tennessee. Decorative set elements were built by San Diego Opera. “There’s no doubt that this program offers the most divergent of movement styles at the highest level of excellence on both sides of the spectrum” -Victoria Morgan Vocal soloists are central to the drama of “Carmina” and are in this instance incorporated into the action. Soprano Alexandra Schoeny and tenor Marco Panuccio, both well known in Cincinnati, are joined by baritone Christopher Clayton, who helped originate this production in Salt Lake City. DeLeone consulted with Cincinnati Opera in choosing the soloists, settling on Clayton partially due to his familiarity with the unique choreographic requirements. The evening begins with the refined “Serenade,” by George Balanchine, set to Tchaikovsky’s sumptuous “Serenade for Strings.” He created “Serenade” almost by accident, simply wanting his dance students to have a new outlet for learning stagecraft. Balanchine incorporated unscripted moments from rehearsals into the work: e.g. the late arrival of a student, a frustrated collapse to the floor, which became the beginning of the slow movement known as “Elegy.” But what most characterizes “Serenade” is its classic elegance of form, with long, sweeping blue skirts against a blue background. 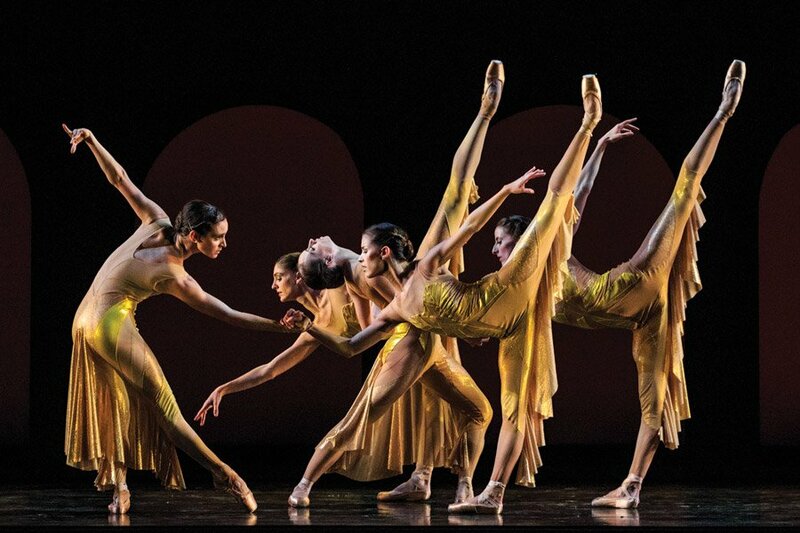 This contrasts powerfully with the raw physicality and medieval, almost tribal feel of “Carmina.” Fonte’s choreography is designed to match the music’s vibrant athleticism. Rhythm is the core musical element of “Carmina,” meant to evoke the medieval poems that inspired the work – a manuscript mostly from the 11th or 12th century. Although attributed to clergical students and monks, the texts are surprisingly bawdy, irreverent, and satirical. “There’s no doubt that this program offers the most divergent of movement styles at the highest level of excellence on both sides of the spectrum,” said Cincinnati Ballet artistic director Victoria Morgan. Cincinnati Ballet presents “Carmina Burana” (Orff/Fonte) and “Serenade” (Tchaikovsky/Balanchine), Carmon Deleone, conductor, Feb. 8-11, six performances at Music Hall.